Spy Hard 1996 - 81 min. 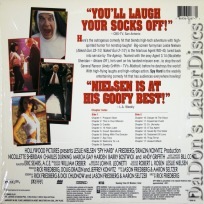 - Color Genre: Comedy Rated PG-13 Country: USA LaserDisc Movie Storyline: As the film's title suggests, "Spy Hard" is an all-out spoof of action and espionage films, in the same vein as the "Airplane" and "Naked Gun" movies. As with those films, the plot (about an armless madman attempting to takeover the world) merely provides an excuse for non-stop sight gags, puns, celebrity cameos and of course, film parodies. Some of the movies spoofed include "Speed," "Mission: Impossible," "Butch Cassidy and the Sundance Kid," "Pulp Fiction," and even "Sister Act."